The IQ Power LPS high voltage power supply provides microprocessor controlled high voltage DC output to the static bar. The high voltage causes the ionizing pins on the static bar to generate positive and negative ions. The electric field from the static charge on the material being processed will attract opposite polarity ions from the static bar causing the material to be neutralized. The excess ions will either recombine in air or dissipate to ground. 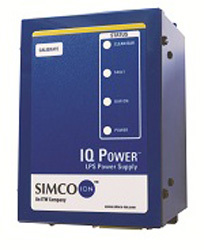 The IQ Power LPS is UL listed. Output Voltage +/-7KV"Speed Bar and Speed-Bar"